Does your driveway have oil or transmission fluid stains? 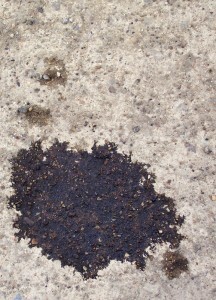 Ever wonder what stains your driveway more, oil or transmission fluid? Quite honestly it doesn’t really matter. Either one will leave a nasty stain. If you leave it too long or you have a chronic problem with your vehicle it may be embedded in the cement permanently. These two fluids left unattended can also lead to pitting in the concrete. Small divots that will let water sit and will eventually crack the surface. If your driveway sounds like the one above you might consider re-surfacing. Hardscapes Inc. has a surface solution for every driveway situation. Fast and professional, get your driveway looking brand new in no time. Get in touch today at 403-547-5597.